The Mexican Peso gold coins were minted in different denominations from 2 to 50 Peso, including the 2.5 Mexican Peso gold coins which make the subject of our article. They were minted starting with 1918 and ending their issuing in 1948. The 2.5 Peso Mexican coin displayed on our website is dating from 1945, a data engraved on the reverse. These small gold coins have an overall weight of 2.0833 grams out of which the pure gold weight is 1.87 grams. This feature belonging to the 2.5 Mexican Peso gold coins makes them to be used in the jewelry industry, having a diameter of only 16 mm. The 2.5 Mexican Peso gold coins are also of an interest to collectors since they can also be regarded as commemorative coins since they were struck after the death of Miguel Hidalgo which succumbed in 1811. He was a priest that started a movement that transformed into the Mexican War of Independence which led to the liberation from the Spanish occupation. The obverse of the 2.5 Mexican Peso gold coins is common to all the gold coins minted by this North American country. It depicts the famous eagle situated on a cactus after capturing a serpent in his beak. It is a classical design that never seems to go out of style and remains simply beautiful and an attraction for investors and collectors from all over the world. At the superior half of the coin is inscribed the country that issued the 2.5 Mexican Peso gold coins ESTADOS UNIDOS MEXICANOS. It is an inscription that reminds the Mexican people of their gained independence. 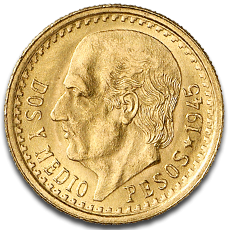 The reverse of the 2.5 Mexican Peso gold coins illustrates the well-known portrait of Don Miguel Hidalgo. He is engraved in the utmost simplicity which could contrast with his tumultuous life, his portrait is facing left. The legend that accompanies him is the face value of these Mexican coins DOS Y MEDIO PESOS and the issuing year 1945. All Mexican Peso gold coins are very appropriate for investment, including the 2.5 Mexican Peso gold coins, because they come at a very affordable price, especially those minted in little denominations like these coins introduced in 1918. At the same time these Mexican coins are very beautiful and were manufactured in high purity. These reasons altogether make the 2.5 Mexican Peso gold coins very popular among investors. The 2.5 Mexican Peso gold coins are a symbol of the newly gained Mexican independence from Spain and they should remind people of the struggle that took place at those times and of all the people that had to die in order for others to be free. It is an impressive story engraved on the obverse and reverse through simplicity and beauty. Therefore, the 2.5 Mexican Peso gold coins are of high importance to collectors, not only to investors. These historic and beautiful 2.5 Mexican Peso gold coins are displayed on our website, ready to find their new owners, at a very affordable price.